One method of protection from contaminated water is through the use of water filtration systems. Each type of system filters various chemicals from the water, but the system you choose may be based on more than just what chemical(s) you are screening for. To learn if there is lead in your water supply you can purchase a water testing kit from Healthy Babies, Bright Futures. To test your water for various chemicals and bacteria, contact your local health department or follow the EPA’s home water testing guide. Your local health department also should be able to provide information on known exposures in your area, or you can look up U.S. water contamination maps and charts on arsenic, lead and perchlorate to see if your family is at risk. Based on what the test reveals, the charts below provide information on what technology is needed to remove the chemicals of harm and what type of filtration system may best fit your needs. Pitcher – These are portable water filter systems, usually containing an activated carbon filter that removes contaminants while improving taste and odor. Most models reduce lead, and are appropriate for drinking water. Faucet/Counter – These systems attach directly to the end of the faucet, or sit on the counter with a line connecting to the faucet. 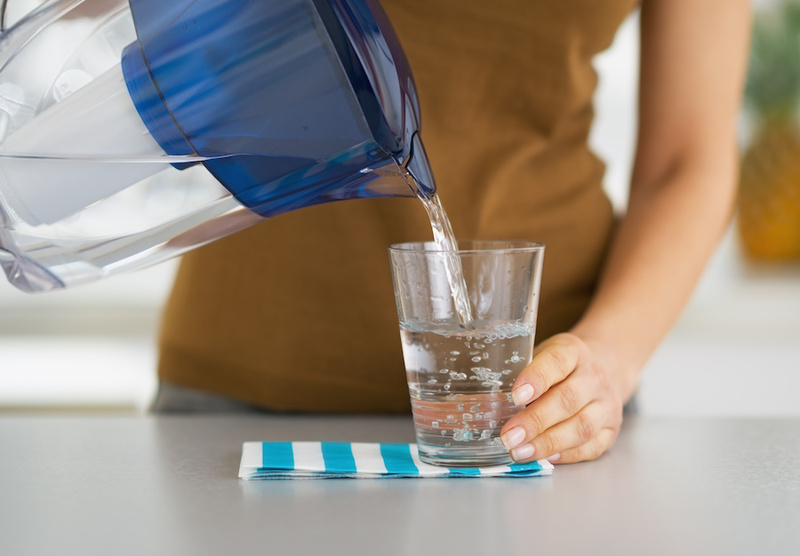 Most have an "on" or "off" position, allowing you to switch between filtered and unfiltered water. Faucet style filters typically use an activated carbon filter that can remove contaminants and improve taste and odor, while counter filters are usually a range of technologies including activated carbon and reverse osmosis. Models vary, but many reduce lead. Under-sink – This system is mounted underneath the kitchen sink and fitted to the water line. Some models have a separate spout or faucet, and can be used for various contaminants. Models use a range of technologies, including activated carbon and reverse osmosis. Effectiveness varies between models, but you should be able to find systems that can remove both arsenic and lead. Whole House – This system connects to the water line entering the house at the water meter so all the water in the home is treated. Depending on where your water comes from, and what is in the water, the filters will differ but you should be able to find systems that can remove arsenic, lead and perchlorate. Reverse Osmosis – This filter process pushes water through a semi-permeable membrane that blocks particles larger than water molecules. It can remove many contaminants, including arsenic, lead and perchlorate. This filter process uses 3-to-20 times more water than it produces. Distillation - This filter process heats water to vaporize it and then condenses the steam back into water. By boiling the water, the process can remove chemicals that have higher boiling points than water such as lead and arsenic. It also can remove minerals, bacteria and viruses. Ultraviolet (UV) – This filtration process uses ultraviolet light to kill bacteria and other microorganisms, but it cannot remove chemical contaminants.